To Fill Four Full Dehydrator Trays? 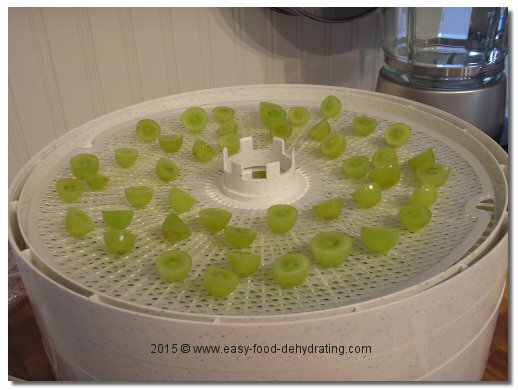 Deciding how much fruit it takes to fill four full trays depends on what size dehydrator you have, so we created this guide. It does help to have a rough idea as to how much fruit to purchase at the store! The reason why I picked how much fruit does it take to fill four full trays is this: FOUR trays is the Nesco Dehydrator brand's recommended minimum tray usage. If you use any less than four full trays, for instance, only two trays, then you are not getting the proper air circulation necessary to dry your fruits properly. Read more about Nesco dehydrators here. They have plenty of great accessories, such as spare trays (I purchased the four-tray starter Nesco); non-stick sheets which are great for making fruit leathers. The non-stick sheets are also great for stopping smaller pieces of food from dropping down into the tray below. When food dries, shrinkage occurs. Excalibur dehydrators also have the non-stick sheets for the same purpose as Nesco. As mentioned in the dehydrator section, I do have an Excalibur dehydrator and a Nesco dehydrator. I use the Nesco on a daily/weekly basis, and the Excalibur is great for proofing bread!